The purity of a traditional flavor, made only with milk and cream from the Italian Alps. Here the cows graze freely, eat fresh grass and drink mountain spring water. The result is a healthy and genuine milk. 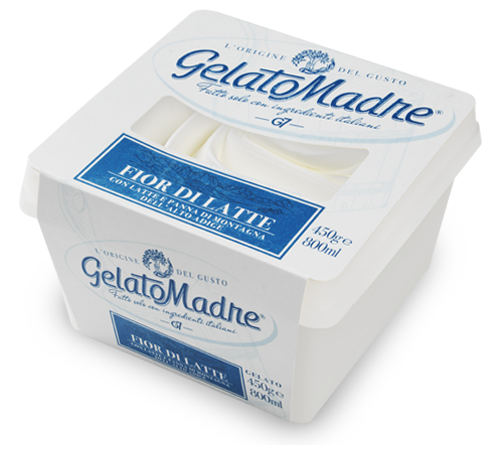 Milk and cream are mixed with a 100% Italian sugar in our GelatoMadre Fior di Latte, a simple Gelato of finest quality. GelatoMadre Fior di Latte: only Italian and 100% natural ingredients, for a unique Gelato going back to the origin of taste. This product obtained from DVN-GL the ISO 22005 certification which guarantees the origin of the raw materials used.